The following information is supplied to assist the real estate industry, and is intended as general information only. It is based on the City of Calgary Land Use Bylaw (2P80) and The Municipal Government Act, which are to be consulted for specific rules and definitions. These suites were constructed with proper permits. They currently met all the rules at construction time, and they currently meet present-day rules. They may also have been approved on a development permit, which allows relaxation of the rules. These suites were built illegally without all the required permits. They did not meet the rules. We often hear of these suites referred to as “mother-in-law” suites. These suites were built legally at the time of construction, but they do not meet the present-day rules. These are usually the result of the land use (zoning) being changed, or the rules being changed. This term is often referred to as “legal” non-conforming because they are considered to be legal. This status may be lost if a building is destroyed or damaged to more than 75% of its value, or if building use is discontinued for more than six months. The bylaws controlling private property have changed over the years. These changes have also included changes to the rules and definitions. Without getting into a long involved legal discussion it is best to simplify the changes that have occurred. The courts have determined that anything constructed (or in use) prior to 1970 is considered to be non-conforming. Effective bylaws said that cooking facilities such as a stove, 220 volt wiring, hot plate, microwave oven or toaster oven were not allowed in a basement suite. The bylaws said that a kitchen (cooking facilities as above, and also sinks, lower cabinets and counter tops) were not allowed in a basement suite. There are many ways you can determine the age of a suite, such as contacting previous owners; interviewing neighbors; judging the age of fixtures, moldings, cabinets, wiring, etc. The City of Calgary responds to complaints about illegal suites, and inspects these properties to see if there is a violation of the Land Use Bylaw. Their Development Field Technicians (through their investigations) determine the date of construction. They also apply the rules as listed above. If a violation is found, the property owners are required to remove either the full kitchen or just the cooking facilities. If the owners fail to comply, legal action is taken against them. The City of Calgary will not inspect properties and determine the legal status of the suite for the benefit of lawyers, realtors, or perspective buyers, nor will the City give a “letter of comfort” for this purpose. A common misunderstanding occurs with R-2 properties. In order for two suites to exist, the rule states that the property must have a minimum 15-metre frontage AND 466 Sq Metres of lot area. 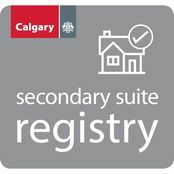 The City of Calgary launched a Secondary Suite Registry and sticker program today, in an effort to promote the importance of legal and safe secondary suites in the city. The online, searchable registry tool and registered sticker program helps Calgarians verify if a secondary suite has been inspected by The City and has met the requirements of Alberta’s building codes at the time of its approval. “Alberta’s building code requirements for secondary suites are important in protecting the public,” says Cliff De Jong, Special Project Coordinator with Planning, Development and Assessment at The City. “The registry program allows Calgarians to verify if a home they are considering meets these requirements.” The online registry and mapping tool allows Calgarians to enter an address, registry sticker number or community to verify a legal and safe secondary suite. Registered secondary suite owners also receive a registered sticker that can be used to promote their suite to current and future residents. The individually numbered sticker corresponds to the suite’s address, which can be verified online. The development permit fee for all new secondary suite applications is being waived until June 1, 2020. On March 12, 2018 City Council, approved amendments to the Land Use Bylaw that allows secondary suites as discretionary use within R-1, R-C1, and R-C1L land use districts. Applicants can now apply for a development permit as the first step in building a secondary suite in these land use districts. standards relating to the design of backyard suites across all districts before the end of 2018. Council directed Administration to help make new backyard suites more acceptable and fitting in communities. To do this, The City is looking at changing some of the Land Use Bylaw rules and developing policy and design guidelines. Administration was asked to return with guidelines relating to the design of backyard suites across all districts before the end of 2018. Backyard suites applications in R-1, R-C1 and R-C1L land use districts will not be accepted until the guidelines are approved by Council. City staff have been reviewing feedback from citizens from previous engagement on secondary suites, the discussions that have been had at Council, and the feedback from adjacent land owners on past backyard suite applications. This work has given city staff a preliminary overview of the major concerns that neighbours have about the impact of backyard suites. Targeted discussions and workshops with Calgary’s community associations to review these concerns and discuss others that may not have been captured are currently underway. Those discussions will form the basis for proposed policy solutions as well as proposed design guidelines for backyard suites. The proposed policy and guidelines will be presented for feedback to the public beginning in June. Backyard suites are only allowed on the same property as single detached dwellings, or contextual single detached dwellings. There must not be more than one suite located on a property. 1.5 m for any portion of the building used as a backyard suite. 0.6 m for any portion of the building used as a private garage. A minimum separation of 3.0 m between the closest facades of the main residential building to the closest facade of the backyard suite. A maximum building height of 7.5 m.
If the rules of the Land Use Bylaw explained above are met, a secondary suitewithin this district does not require a development permit; only a building permit is needed. Backyard suites are only allowed on the same property as single detached dwellings or contextual single detached dwellings. There must not be more than one suite located on a property. 1.5 m for any portion of the building using as a backyard suite. * Suite area does include common area or the area below stairways and landings. Required floor area can be relaxed to a maximum of 10 per cent through a development permit application. A maximum suite floor area of 75 m2*. A minimum separation of 3.0 m is required between the closest facades of the main residential building to the closest facade of the backyard suite. Backyard suites are listed as a discretionary use in R-CG and M-CG. Backyard suites are only allowed on the same property as single detached dwellings, contextual single detached dwellings, semi detached dwellings, contextual semi detached dwellings or row houses. There must not be more than one suite located on a property. The accessory residential building or backyard suite on the adjacent property has a setback of 0.1 m or less at the shared side property linefor any portion of the building that is recessed 0.6 m or greater from the front façade or the rear façade of the building and is setback less than 0.6 m from the side property line. The building setback is not greater than 0.1 m from the side property line for any portion of a building that is recessed 0.6 m or greater from the front façade or the rear façade of the building and is setback less than 1.2 m from the side property line. The wall at the shared side property line is constructed of maintenance-free materials and there is no eaves overhanging onto an adjacent property. All roof drainage from the building is discharged through eavestroughs and downspouts onto the property. A minimum of one motor vehicle parking stall, in addition to what the property currently requires; however, no parking stall is required when the floor area of the secondary suite is 45.0 m2 or less. There is no requirement for a building setback from a property line with a party wall. * Suite area does not include common area below stairways and landings. Required floor area can be relaxed to a maximum of 10 per cent through a development permit application. Backyard suites are only allowed on the same property as single detached dwellings and contextual single detached dwellings. There must not be more than one suite located on a property. Backyard suites are listed as permitted use in R-G and R-Gm. Backyard suites are only allowed on the same property as single detached dwellings, semi-detached dwellings, and row house buildings. There must not be more than one suite located on a property. A minimum building setback from a side property line of 1.2 m for any portion of the building used as a backyard suite, except if the party wall separating two or more dwelling units is on the property line. A maximum building height of 10 m.
City approvals are required to build a new secondary suite. These approvals are determined through the Alberta Building Code. The following list highlights some of the main criteria to consider if you are building a new secondary suite. Please note this list is not all-inclusive. Contact the Planning Services Centre at 403-268-5311 for more information about secondary suites and backyard suites. New work and replacement of “like for like” mechanical components and systems normally requires building, gas and/or electrical permits. Please see the Alberta Permit Regulation and the Calgary Building Permit Bylaw for details. On a property locaed inside the airport vicinity protection area (AVPA), the suite must be located in the basement of an existing single-family development. For a printable download of this information which reviews these different types of secondary suites, visit the download box below.